Like a lot of old car guys these days, the car bug bit me early in life. As a child, I would watch the cars go by and dream of the day I could drive and have my own set of wheels. In 1955, my cousin and best friend, Frank, found a cherry 1940 Plymouth Sedan for sale with only 45,000 original miles on it and I quickly purchased it for the grand sum of $90! With such low miles, it was a very nice car that didn’t need much, but at fourteen years old I needed more power to suit my young ambitions and need for speed. In searching for ways to make it as fast as I could, I found and made friends with a professional motor builder by the name of Charlie Bell. He raced at the San Jose race track and was the lone wolf with a Chrysler product in a pack of Fords and Chevys. He’d consistently get put in the back of the pack because of his low qualifying times. Before long he would be leading in each of those races and was always a winner. Many thought he was a cheater, but he followed the rules. He was simply a magician when it came to building motors and he did some things that were way ahead of his time. 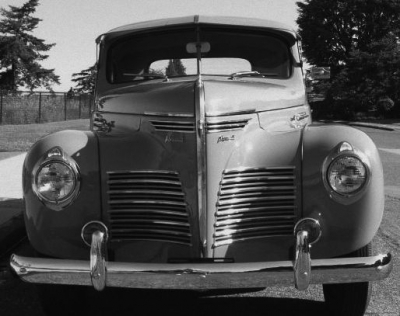 My relationship with Charlie lasted for many years and the 1940 Plymouth ended up with many of Charlie’s motors. He’d build one for himself and run it in his hardtop for a while and then, eager to try some new idea he’d have, would say “You want to run this motor I’m going to take out of my car, Ron?” Well, each one always had more power than the one he’d passed on to me before, so it was a no brainer. Between 1955 and 1959, when I graduated high school, my car became the grateful recipient of five of Charlie’s motors. In the end, that ’40 Plymouth wound up with a Chrysler six-cylinder motor that was just shy of 300 cubic inches and produced almost 200HP. Not bad for a flathead six in anybody’s book! It also had a 1938 Imperial T-85 Borg Warner 3 speed transmission with overdrive and ran 86 mph in 15 seconds on the 1/4 mile track. Charlie was more than just a source for inexpensive and fast motors. He was truly a friend and someone I respected, if not idolized. I spent many hours just watching Charlie do his magic motor builds in his shop. The guy was an artist with a motor, doing innovative things that no one else considered possible at the time. As a side note: At some point along the way, a young guy named Bobby Gaines became Charlie’s partner in the shop. Charlie obviously had a great impact on Bobby, as well, because when Bobby went into business for himself years later, he left Charlie’s name on his business. To this day, the business is still located in the heart of Modesto and is called Bell and Gaines. Charlie passed in 1977 of a heart attack. In 1956, I took my ’40 Plymouth and joined a car club called The Modesto Throttlers, a long time Modesto car club. The club had about 15 members, both young and old. We rented a garage with a pit and a resting room and loved to work on our cars to our hearts content and or the limit that our budgets would allow. Over the years, I’ve had some wonderful times and built some cherished memories with the guys in The Throttlers. I still am a member and at 72 I am one of if not the oldest member. I attended Thomas Downey High School in Modesto. George Lucas was about 2 years younger than I was. In fact, he was in the same class as Bobby Gaines. The movie, American Graffiti, was a true chronicle of our high school days and a lot of what was depicted in the movie actually happened. In those days, when we cruised, it was called Dragging 10th. There was a loop that everyone would gather on and drive and yell out windows, just being teens in cars. It really was just like in the movie. That’s where we would cruise and there was just cruising there; no racing. I raced on the other side of Hwy 99 on Maze Blvd and Blue Gum Ave, but never twice in one night. If I’d been seen, I didn’t want to be seen again. There was also racing on Paradise Road, which was the main road to Tracy, but I personally never raced there. All racing was done with one person in the car; just the driver and no passengers due to the additional weight. We were serious about our racing and all of the races were done from a dead stop. I don’t recall anyone getting tickets from the CHP. If I lost a race, I was upset and needed to figure out a way to do better. This usually involved Charlie Gains and a more powerful motor and a tweak here or there to optimize performance. Charlie was all about performance. Speaking of the movie, American Graffiti, and whether it was realistic; there is one scene in the movie that I think stands out as one that movie goers for years have probably wondered about. Here is the real deal as I watched it happen. I was standing at Burge’s Drive In, the inspiration for Mel’s in the movie, looking south on 9th St. About 200 yards away, across street and to the south, two cops were sitting in their car and not doing much. One of the guys from school crawled under the car and chained the axle of the cop car to a pole. A close friend, who shall remain nameless, in a 50 Olds with a beefed up motor, went smokin’ up the street. Just like in the movie, the cops fired up their motor and lit out after him and made it as far as the end of the chain. If the movie had never been made, this still happened. Whether George Lucas was somewhere in the vicinity and saw it or heard about it later I don’t know. I do know that I did see it and knew the people involved very well. That’s my story and I’m sticking to it. After I graduated in 1959, life led to more cars and more adventures. For graduation, I got a 1959 Plymouth and went to school in San Francisco. I should have slowed down and studied, but I couldn’t help myself. Going fast was in my blood, I guess. Instead of buying school books, I bought car parts. Instead of hitting the books at night, I hit the Pacific Coast Highway in my ’59 Plymouth and ran the wheels off of it racing anyone that thought they could go faster than me. In 1962, I married my high school sweetheart, Donna, and in 1972 we moved to Cypress, CA where we live to this day. She is still my bride and best friend and very much a part of my addiction to the old car hobby. While we don’t run as fast and as hard as I did in my youth, we still play in the old iron. Our fancy these days is old Ford trucks and we belong to the Orange County Chapter of Pickups Limited. We have made many great friends and the club is growing rapidly. We love to go with them to local shows and have tons of fun. There are members who have stock trucks and some members that have pretty expensive show trucks. Lots of the work trucks back in the day are now trophy winning show trucks. 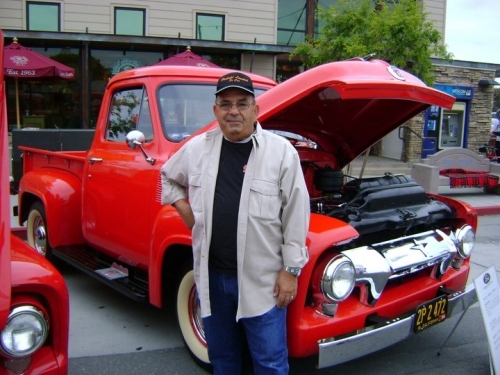 In 1997, I came across a 1954 Ford F-100, which I purchased from a neighbor who was in the process of moving. The truck is stock with 223 cubic inch six-cylinder motor and a Ford-o-matic transmission. It has been a pleasure to work on and maintain and has won many trophies on the strength of being stock, with very minor changes. It has 15 inch wheels and tires, electric wipers and a header that I added so I could have dual exhaust. Other than that the truck is original. I have lots of fond memories of my youth and the fast times. These days, I’m enjoying life with a wonderful lady and great friends and I still enjoy each moment I get behind the wheel of my favorite ride. What more could an old Modesto “speed freak” ask out of life?